Back in Windows XP there was an important Power toy created to enable ClearType for users of LCD screens. Now it’s standard in Windows 7, but you may not know about it. So let’s take a look. Click on the Start Menu and type cleartype into the search box and hit Enter. It should be enabled by default, but if not just check the box to enable it. Now, in the next step, you can enable it for two or more monitors if you have them. Or you could select an individual one if it works best for one but not another. Some people might want it turned off if they have a CRT and a LCD monitor for example. Now you can go through the wizard and pick out what resolution works best for the monitor(s) you choose. 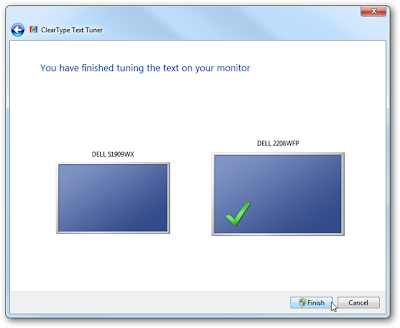 This is a cool trick you may not have known about that already exists in Windows 7, and it can definitely help you get the best look of the text on each screen if you’re using different monitors! You may have to experiment with some different settings to get what works best for you.